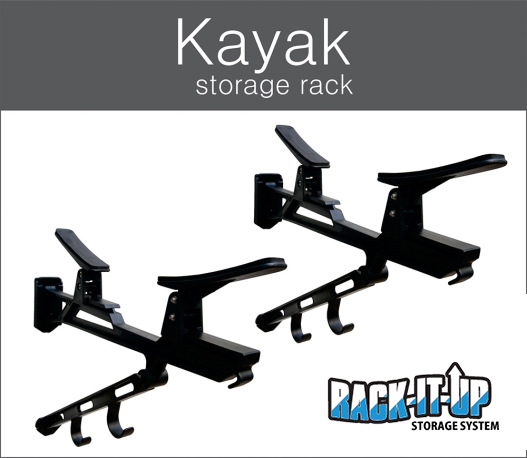 The Rack-It-Up Kayak Storage Rack is made with adjustable padded cradles that slide and tilt to conform to the kayaks hull for a perfect fit. The rack also provides the perfect storage for paddles and doubling as a hanger for life jackets or other accessories. Use screws appropriate to your wall type (8 gauge x 35mm countersunk screws are appropriate for most situations). Fix the screws through the holes provided in the Universal Sleeve to a wall stud, (use wall plugs if not going into studs) then simply slide the rack arm into the channel provided, from top to bottom and then screw the brace arm into the wall so simple. NOTE: Screws not included in package: select your own to suit your requirements. All items will be posted within two business days after purchase, please allow 2-4 days for delivery. There is a standard flat freight fee of $6.50 for purchases, ensuring fast and careful delivery of your order. 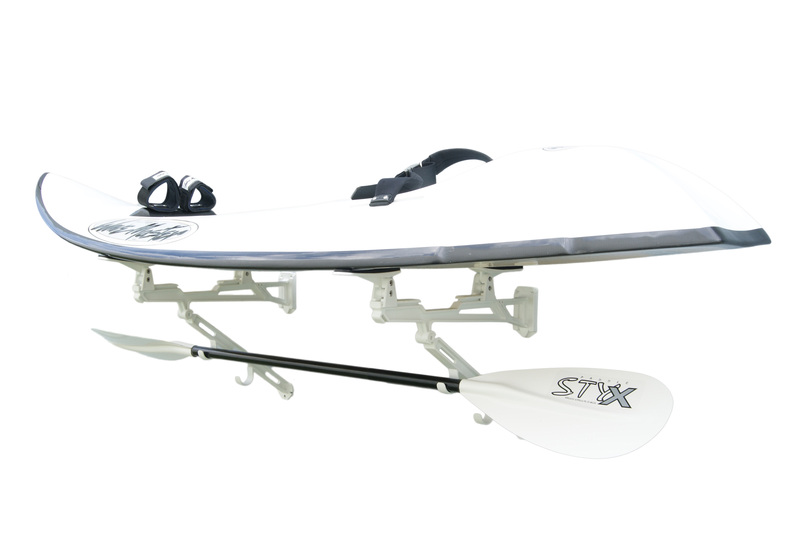 PRODUCT FEATURES • Sturdy Rack made from Engineering Reinforced Glass-Filled Nylon • Rack Capacity = 1 Kayak + 2 Paddles + Kayak Gear • Rack holds up to 50kg (110lbs) • Holds K1, K2, Ocean Kayaks, Touring Kayaks and Surf Skis • The padded cradles both slide and tilt for the perfect fit to your Kayak • Ideal for use indoors or outdoors will never rust WHAT’S IN THE BOX? • 2 Interchangeable Sleeves • 2 Arms • 2 Supports • 4 Padded Adjustable Cradles Rack can be mounted to any wall material, drywall, tile, stucco/plaster, wood, brick or concrete. The Mid-Full Surfboard Display Rack is a great way to show off your boards in a tidy format, projecting at just 15 degrees vertical from your house or garage wall. 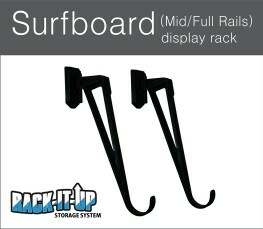 PRODUCT FEATURES • Sturdy Rack Manufactured from engineering reinforced glass-filled nylon resin • Perfect for displaying mid – full rail boards • Rack Capacity = 1 Surfboard • Holds up to 18kg (39lbs) • 15 degree angle • Can be mounted any distance apart to accommodate all different length surfboards • Display Rack WHAT’S IN THE BOX? • 2 Interchangeable Sleeves • 2 Arms • 2 Rubber Pads (For Board Brotection) Rack can be mounted to any wall material, drywall, tile, stucco/plaster, wood, brick or concrete. 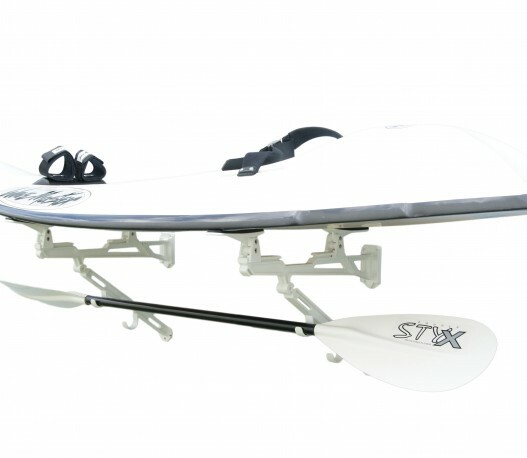 The Surfboard Storage Rack is easy to install, effective and economical; the surfboard rack will fit any kind of surfboard and hold up to 18kg. The design of the rack makes it perfect for stacking with an easy bracket removable feature when not in use. 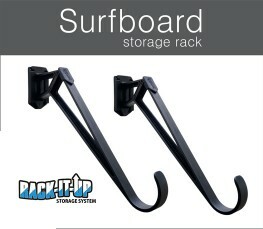 PRODUCT FEATURES • Sturdy Rack Manufactured from engineering reinforced glass-filled nylon resin • Rack Capacity = 1 Surfboard • Holds up to 18kg (39lbs) • Can be mounted any distance apart to accommodate all different length surfboards • Storage Rack for all Surfboards • Great way to Organize your Garage • Rack Protrudes from wall 440mm (17″) • 45 degree angle • Will Never Rust WHAT’S IN THE BOX? • 2 Interchangeable Sleeves • 2 Arms • 2 Rubber Pads (For Board Protection) Rack can be mounted to any wall material, drywall, tile, stucco/plaster, wood, brick or concrete. 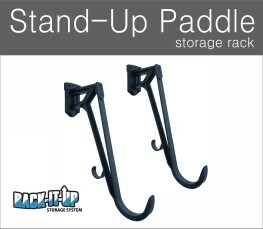 The Rack-It-Up Stand Up Paddle Storage Rack is uniquely designed to allow the stand up paddle board to be kept close against the wall and show off its style with minimal visual interference from the rack. 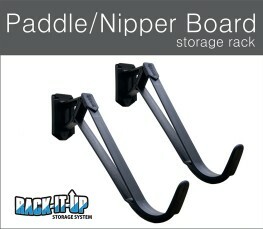 The rack also provides perfect storage for your paddle. PRODUCT FEATURES • Sturdy Rack made from Engineering Reinforced Glass-Filled Nylon • Rack Capacity = 1 Nipper Boards or Mal Board • Holds up to a 18kg (39lbs) • Can be mounted at any distance apart to accommodate all different length boards • Storage or Display Rack for your Nipper Boards or Mals • Great way to Organize your Garage WHAT’S IN THE BOX? • 2 Interchangeable Sleeves • 2 Arms • 2 Rubber Pads (For Board Protection) Rack can be mounted to any wall material, drywall, tile, stucco/plaster, wood, brick or concrete. This Surfboard Display Rack for fine railed surf boards is easy to install, an effective use of space, and a great way to store your favourite surfboard! 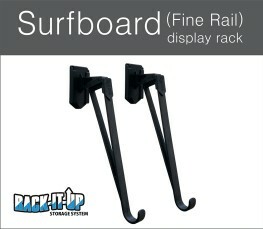 PRODUCT FEATURES • Sturdy Rack Manufactured from engineering reinforced glass-filled nylon resin • Perfect for displaying shortboards (Fine Rail Boards) • Rack Capacity = 1 Surfboard • Holds up to 18kg (39lbs) • Can be mounted any distance apart to accommodate all different length surfboards • Curl size 1 3/4″ – 15 degree angle • Rack Protrudes from wall 260mm (10.2″) WHAT’S IN THE BOX? • 2 Interchangeable Sleeves • 2 Arms • 2 Rubber Pads (For board protection) Rack can be mounted to any wall material, drywall, tile, stucco/plaster, wood, brick or concrete. 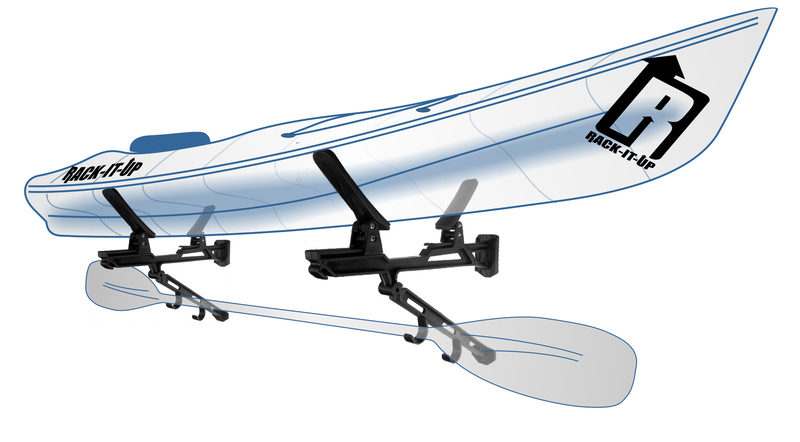 Designed to fit almost any kind of Wakeboard or Kiteboard and designed to keep the board out of harm’s way until next session. 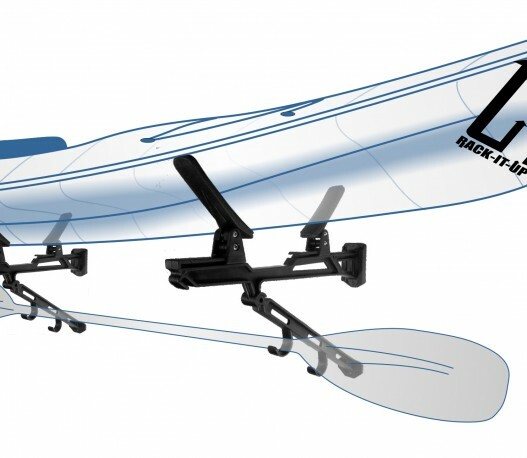 PRODUCT FEATURES • Sturdy Storage Rack made from Engineering Reinforced Glass-Filled Reinforced Nylon • Rack Capacity = 1 Wakeboard or Kiteboard • Holds up to 18kg (39lbs) • Can be mounted any distance apart to accommodate all different length Wakeboards or Kiteboards. 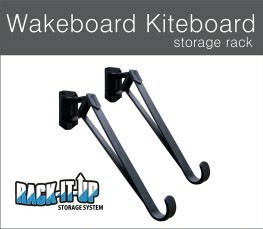 • Storage Rack for your Wakeboard or Kiteboard • Great way to Organize your Garage WHAT’S IN THE BOX? • 2 Interchangeable Sleeves • 2 Arms • 2 Rubber Pads (For Board Protection) Rack can be mounted to any wall material, drywall, tile, stucco/plaster, wood, brick or concrete. Versatile and Stylish Storage and Display Racks for your Sports Equipment and Accessories. ©2015 Rack It Up New Zealand. Website designed and developed by Distil. NB. All Prices shown exclude GST. GST is calculated on the checkout page.